As human migration progressed throughout the world, genetic isolation led to the development of distinct populations that shared common DNA and other genetic material. Race is defined as a group related by common descent or heredity. Often, these groups also share similar phenotypic traits. Outside of genetic characteristics, race can also include cultural and ethnic similarities of a people. Though different populations developed through the process of migration and genetic isolation, all humans fall under the same species, Homo sapiens. The field of eugenics, which posited that most human phenotypic and personality traits were controlled by genes, was developed at the beginning of the 20th century (Allen, 2011). The practice of eugenics was often used to discriminate against certain racial and ethnic groups based on their DNA. There are many ethical problems with this now-discredited branch of “science,” in addition to the problems associated with the fraudulent scientific methods that were used to show support for the movement. Today, researchers that are interested in genetic variation between populations focus on differences that have arisen from divergent evolutionary histories rather than trying to find a scientific or medical definition for “race”. For example, skin color is genetically controlled. All humans possess the many genes involved in determining skin color. However, these genes have different versions (alleles) that ultimately control an individual’s pigmentation. Scientists believe that all humans evolved in Africa and originally had dark skin. As groups left Africa and migrated north, there was selective pressure for lighter skin to evolve to allow for sufficient vitamin D production (which requires UV radiation). We find another example of genetic variation due to environmental pressure in the people of Tibet. Eighty-seven percent of Tibetans have a version of the HIF2a gene (hypoxia-inducible factor 2-alpha) that allows them to live at high altitude with no ill effects. In comparison, only 9% of Han Chinese carry the same version of HIF2a. Scientists are also interested in understanding how shared ancestry relates to disease risk. For example, Ashkenazi Jews, who descended from a common people and region, are more likely to carry the gene mutation that causes Tay-Sachs disease, for which there is a high morbidity rate and no known cure (NIH). 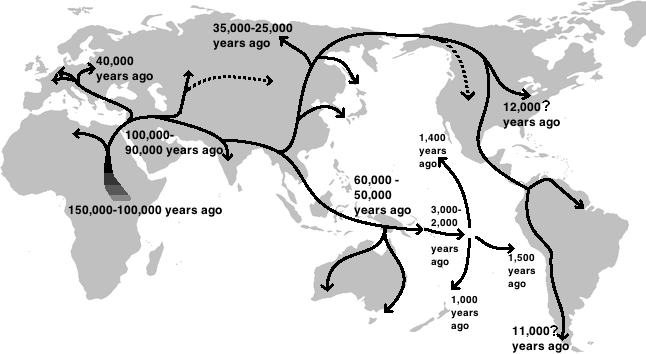 Proposed routes and dates of human migration out of Africa. Allen, Garland E. Eugenics and Modern Biology: Critiques of Eugenics, 1910-1945. Annals of Human Genetics 2011; 75: 314-325. National Institute of Health (NIH). “Tay-Sachs Disease Information Page.” Last updated 6 Oct 2011.